They say "Diamonds are a girl's best friend", well I would have to disagree. Diamonds are not the accessories I'm looking for. My accessories are hats, scarves and anything hair related! Over the past year I've become a fan of Forever 21. I like how you have the choice to go to the store or shop online. They have a variety of clothing and accessories for all shapes and sizes. Although they have clothes that are expensive, they also offer a lot of affordable ones as well. Like I said before I love accessories, so I brought a lot of headbands/bows! Unfortunately they don't have these items anymore from their online store. I looked everywhere, but they might still be in stores. I'm a little sad about this, because these are affordable but the quality is very good. I thought I would just share with you the items I have. I'm hoping that they bring these back though for Christmas time. As I have mentioned before in the past, I have a love/hate relationship with my hair, so these are useful for when I don't what to do my hair. That sounds bad doesn't it? Doing my hair is a long process and I don't have time for it, so adding accessories helps a lot. I have listed the information below the picture including the price. For some I don't know how much they cost, because I got them as a gift from my sister. I'm pretty sure they would be around the same price though. 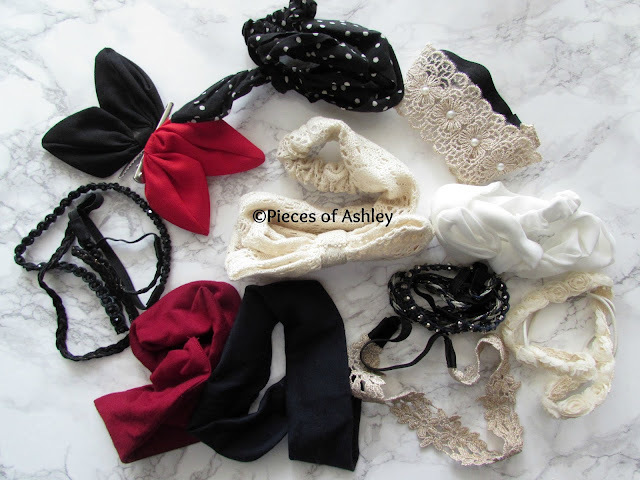 The ones that are not listed: the Burgundy/Navy Headband Set, the Black w/ White Polka Dot Headwrap, the Cream Rose Headband, and I'm not really sure of the last one but it looks like a lace flower headband. It's pictured next to the Navy headband. If I find these hair accessories online somewhere else, I will update this! I hope you have enjoyed reading and let me know if you like Forever 21 too! I love Forever21, their accessories are amazing! Yeah I love them too! I've brought hats and scarves, even a few sweaters. I like how their versatile.